All Van Halen items listed below are authentic and very limited. We do not carry multiple items. All prices and availability are subject to change. All prices include shipping and handling for all USA customers. All other destinations will require actual shipping cost to complete transaction. Have a question? Ask us before purchasing the item. Thank You. Description: Eddie Van Halen Concert Tour Guitar Pick. Description: Van Halen Michael Anthony Concert Signature Tour Guitar. band Logo. Description: Van Halen Sammy Hagar Concert Signature Tour Guitar. band Logo. 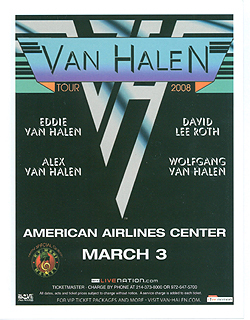 Description: 3x5 Full Color Van Halen 2008 concert handbill. 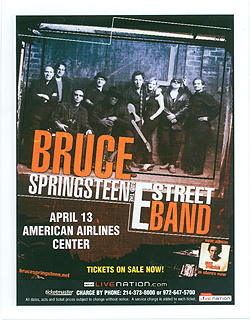 This is a double-sided handbill with Bruce Springsteen 2008 Tour handbill. 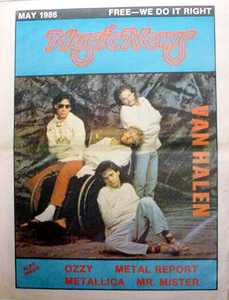 Description: 1986 Music News Magazine featuring Van Halen. 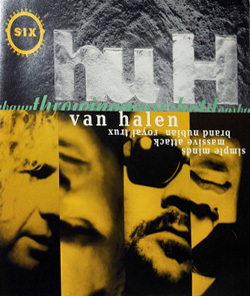 Description: Van Halen - Huh Magazine. 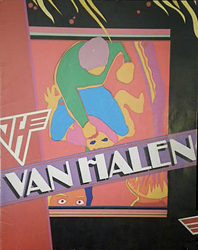 Description: Van Halen lll Promo Poster. Size 48x48. Item in VG+ condition. Description: Van Halen lll Promo Poster. Size 18x24. Item in mint condition. Van Halen Ticket Stub: Rare original concert ticket stubs.